Yesterday, we made the flower pots for our gorgeous tulips using Northcott’s Artisan Spirit Shimmer Echoes fabric collection. 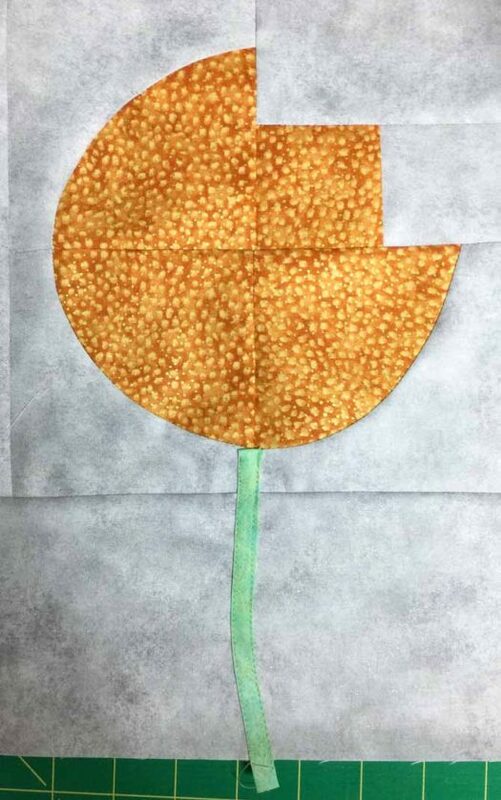 Today, we’re going to make bias tape for the tulip stems, and assemble the quilt. There are lots of advantages to making your own bias tape. You don’t have to buy it, and you can make it in any color, using a solid or patterned fabric. How fun is that! 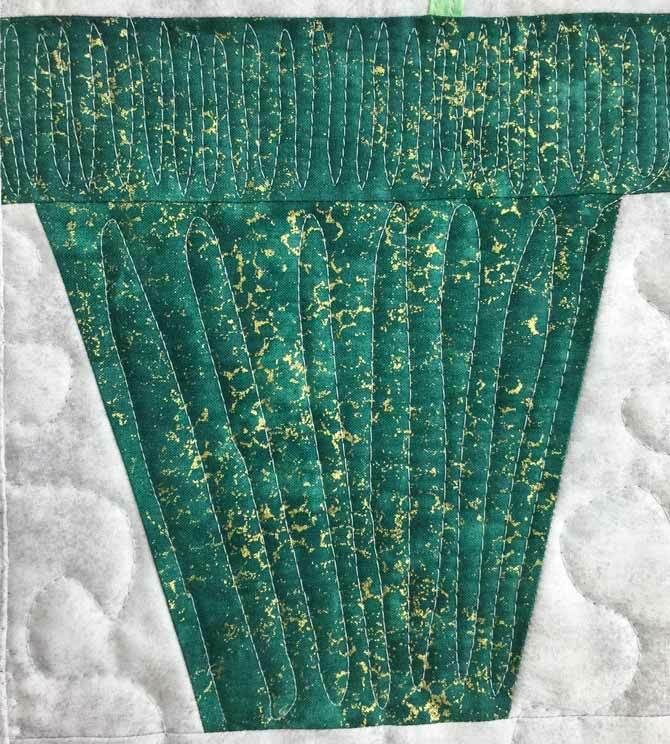 Use the CLOVER 464/12 – Bias Tape Maker, and the green fabric we set aside for the stems, to make four stems approximately 7” long. 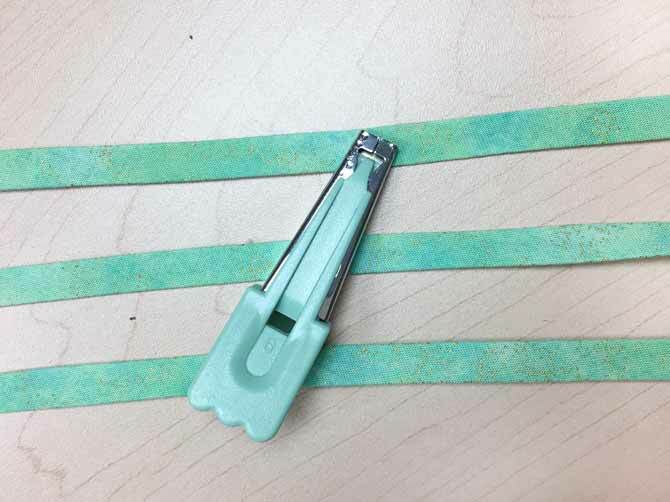 Make bias tape for stems using the Clover Bias Tape Maker. Lay out all the blocks. Sew two flowers together, next to each other. Repeat this step with the remaining two flowers. 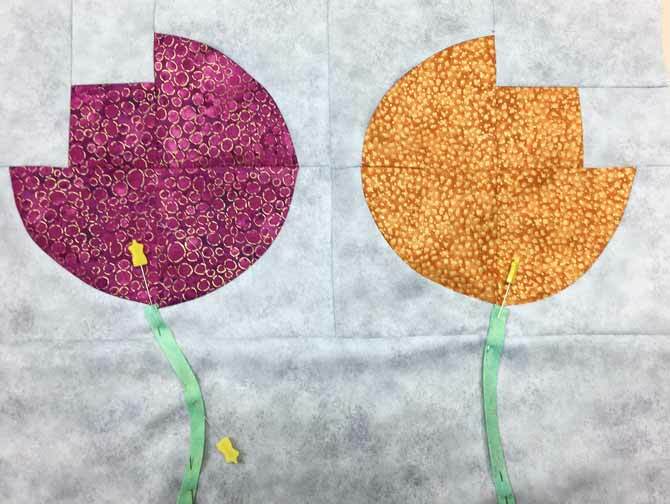 Sew the two flowers together, then sew the remaining gray rectangles to the bottom of each of the flower blocks. Sew the remaining two gray rectangles to the bottom of each set of flower blocks. Pin the bias tape starting at the base of the flower, tucking in the top of the bias tape under itself, and allow the bias tape to overhang at the bottom of the gray fabric by a ½”. Add a curve for fun. Pin the bias tape in place adding a fun curve to the stem. Sew down both sides of the bias tape. Take your time so you get a nice even stitch along the edge. Trim the bias tape that’s hanging over the gray fabric. And sew the completed flower block set, with gray strips and stems, to the two flower pot block set. Repeat with the other blocks, and then sew the two sets together to make your quilt top. To quilt the wall hanging, I did free motion quilting on the gray background. For the flowers, I outlined the shape with spikes in the center. For the flower pots, each one I did in a different design and loved how it created so much texture! After you finish quilting, trim and bind. Using the Northcott Artisan Spirit Shimmer Echoes fabric collection added a springtime feel to this tulips quilted wall hanging. And, using my own hand made bias tape for the tulip stems added just the right touch. 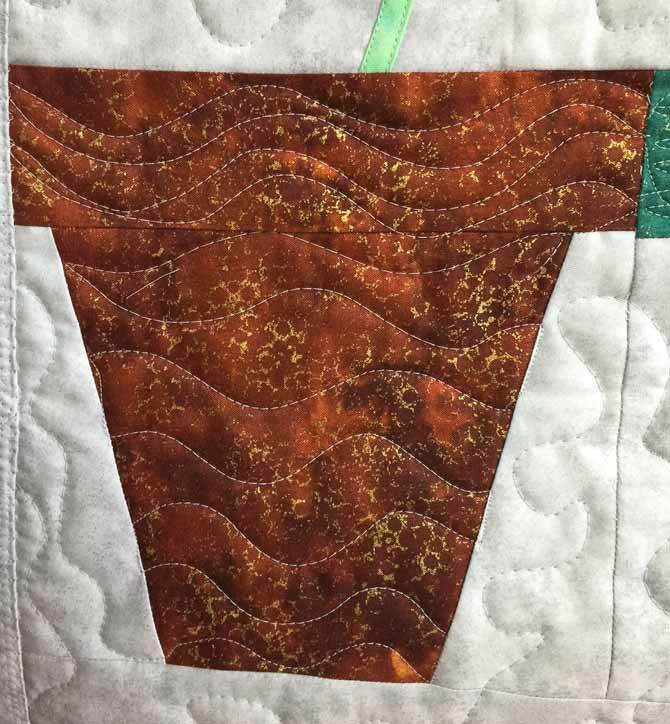 I think I’m going to make another one and try more fun quilting patterns and colors for my tulips! 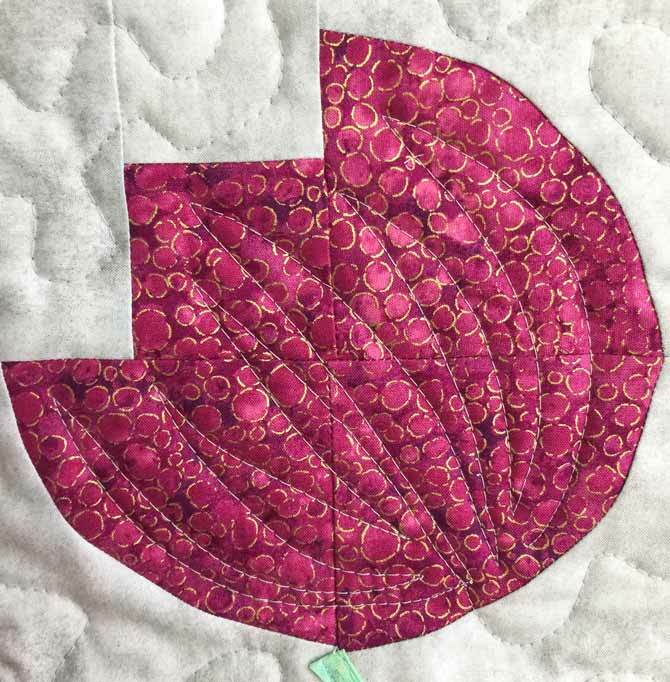 Thanks for the great tutorial on appliqué using bias stems. I love this fabric collection with the beautiful colors.